There is nothing like a good old scratchy record to make a wonderful music experience. I recently got a spiffy new record player that has a USB connection on it to easily rip vinyl for CD or IPod. That's right! Most people love buying music from Itunes or ripping CDs. I now rip vinyl. Why? I love the sound. Even my vinyl rips even though downgraded to MP3 sound better than some CDs rips. Anyway, after I got my spiffy new record player it was time to hit the thrift stores for old used records. The hunt can be overwhelming, shifting through old polka and I don't know how many Barry Manilow records. I mean, seriously. I have never gone to a thrift store and not seen a handful of Barry Manilow records. It made my mom happy once, there was one record that she loved but was hard to find on CD. So I found it at the thrift and burned her a copy, but that was a long time ago. The record is scratchy as hell and I gotta say it adds so much to the atmosphere of the record. The record is narrated by Mr. Mountain Dew. Never heard of him? Neither have I and there's not much information on the web about it. The guy sounds like the guy who narrates the Big Lebowski. He tells the stories of the songs inbetween. 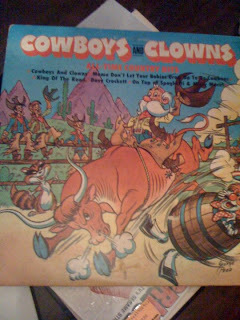 The songs include: Home on the Range, Mama Don't Let Your Babies Grow up to Cowboys, King of the Road, Daniel Boone, Billy the Kid among others. If you ever come across this record it's a must buy! As far as I know this record was never released on CD. In fact, I looked up the record label, Peter Pan, and could not find any information on it. This is a record I have already ripped into the computer and ready for the Ipod. The boys seemed to enjoy the record. I put on the record as one was in a walker and the other was in my lap. I sang along with Home on the Range and Davy Crocket. They were in a bit fussy because of their teething however singing to them really helped. I am gonna go as far as to say this record would be great if you want to make a really weird mix tape for someone. Heck, I think I would even listen to this record on my own. I will say that One Top of Old Smokey is a track I would cut though. It is the only one that doesn't really fit in.